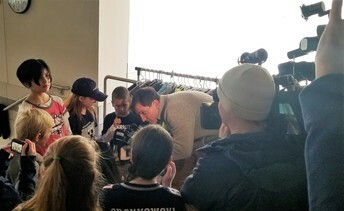 WBZ-TV, NBC Boston and WBZ Radio joined last Friday’s Patriots rally at Bancroft Elementary School. Fourth graders Anna McDuffy and Hannah Trahan joined fifth grader Nate Waldinger and kindergartener Jack McKenzie in interviews with reporters about the importance of teamwork and sportsmanship, and of course, their excitement for another Patriots’ Super Bowl victory! Happy Chinese/ Lunar New Year to all who celebrate! 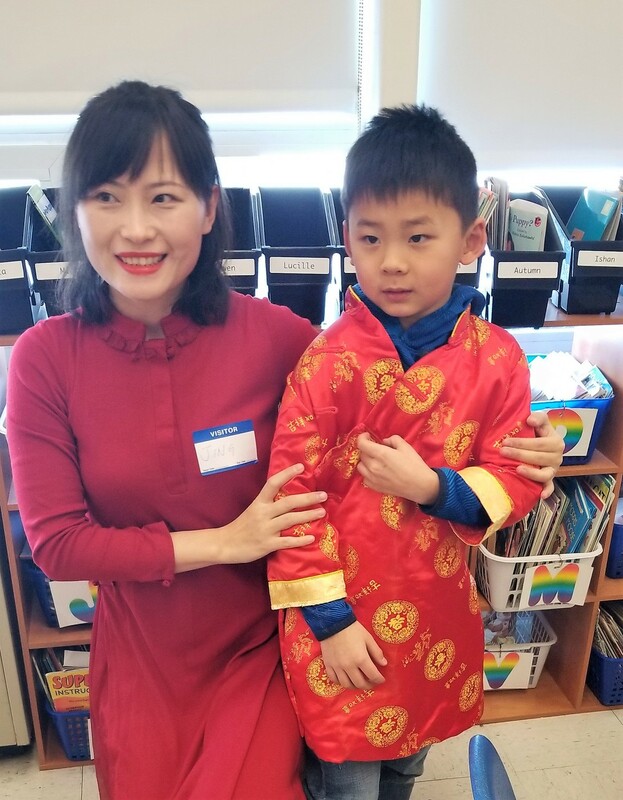 Jing Lu joined her son, Bowen Lu at West Elementary to share the customs and traditions with students in Mr. Cyr’s first grade class. Students were treated to a video on the history of the New Year, the legendary story of Nian and the new moon, and how the Chinese Zodiac signs were chosen by the Jade Emperor. Bowen did a great job continuing the celebration by reading Bringing In the New Year, by Grace Lin to his classmates. Jing Lu brought materials for the students to create lanterns and pigs to bring home to share with their families. 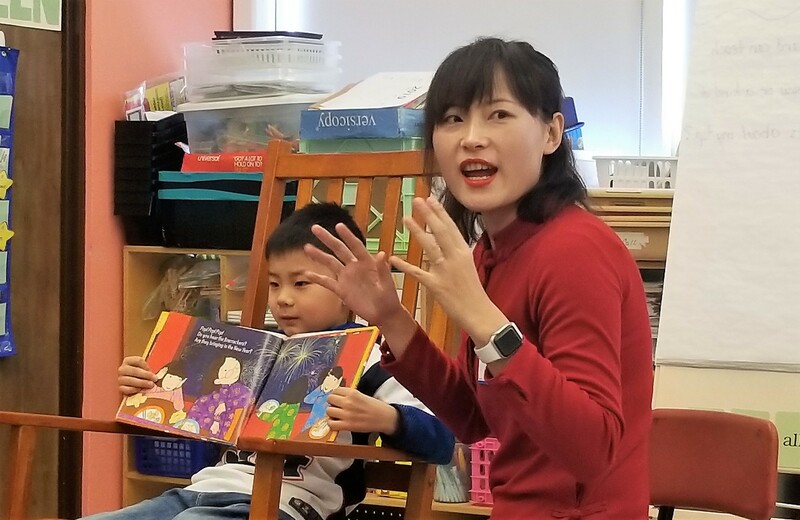 This was Jing’s second year celebrating the New Year with Bowen’s class at West Elementary. Jing was born and raised in China, coming to the United States to study engineering at Northeastern University. Bowen is learning Chinese, attending Chinese School a few times a week, and loves knowing his background and culture. Chinese New Year begins on February 5, 2019 and continues for 15 days. It is also known as the “Spring Festival,” and the holiday marks the end of the coldest days. In some countries, like South Korea and Vietnam, it is called the Lunar New Year. The Spring Festival was originally a ceremonial day to pray to gods for a good planting and harvest season. 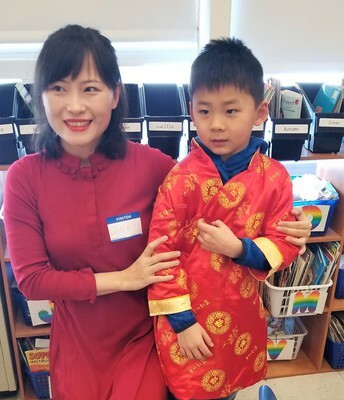 Traditions include wearing red to protect from bad luck or evil, eating certain foods for good fortune, and giving red envelopes with money as gifts for children. The New Year greeting in Chinese is “xin nian kuai le” and the phrase literally means “Happy New Year.” But in Hong Kong and other Cantonese-speaking regions, it's more common to say “gong hei fat choy.” In Mandarin Chinese, it's “gong xi fa cai.” It means “congratulations on the fortune.” Enjoy the New Year! APS Program Specialist Brian Saad looks toward the future of the TOPS (Transitional Opportunities Program) and sees growth and promise for the program and his students. TOPS is a collaboration between Andover and North Andover public schools, and provides transition services to post-high school students between the ages of 18-22. Seven years ago, Brian was the first teacher working toward lifelong learning for six students in the program. Today, the TOPS program has evolved into a successful program with 27 students, with 18 of them taking community college courses. Brian’s goal for his team of teachers and paraprofessionals is to provide students with the skills to be successful members of their community, live independently, and attend college or find employment. 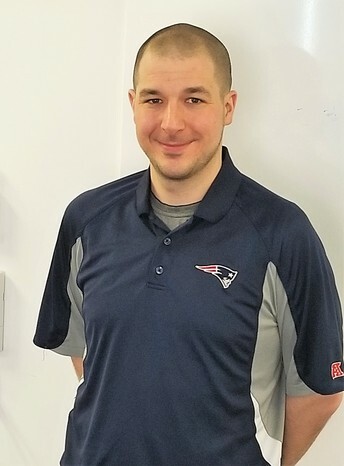 Brian has more than a decade of experience in special education, starting his career at the New England Center for Children while studying at Simmons College. Brian knows the opportunity to work with the TOPS program is unique and loves that every day is a different experience. The best part of his job is seeing the students succeed, and watching their progress and achievements. He takes pride in getting them connected to resources that will provide the students and their families with additional support. He recognizes that each student has specific needs, and tailors the program to help students reach their personal best. Brian has worked to build relationships within the community to benefit all in the TOPS program. Students can attend North Essex Community College, work with APS Director of Nursing Rita Casper on building healthy social and emotional relationships in a safe and supportive environment, or gain career training skills for employment at one of the many vocational locations, such as Pfizer, the YMCA and the MSPCA. The TOPS staff and students have demonstrated their commitment to inclusion and are involved in Special Olympics and Unified Sports. In the fall of 2018, AHS was named an official Special Olympics Massachusetts Unified Champion School, with the opportunity to apply for national recognition this spring. Brian also coaches the indoor/ outdoor track teams at AHS. Not much rattles Brian and his positive attitude is infectious. Looking ahead to the future, giving his best to the students and their families, and providing them with opportunities to thrive are great sources of pride and joy for Brian. Fans of Boston’s professional sports have enjoyed a great few months recently, from the Red Sox World Series win in October to last weekend’s New England Patriots Super Bowl victory—their sixth since 2002. Watching these teams and their coaches celebrate never gets old, and provides us with the opportunity to see positive leadership, teamwork and sportsmanship in action. 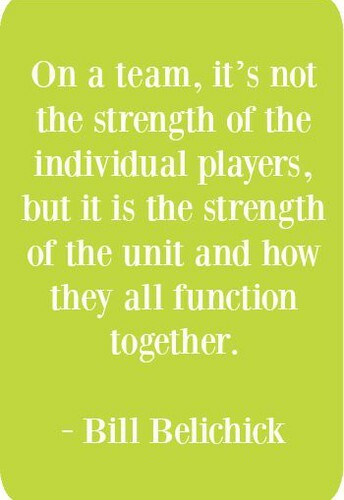 Bill Belichick is often cited as one of the most influential coaches in the NFL, and he’s been quoted many times on the importance and value of teamwork. If you walk through Andover High School on any given day, you will see quotes from Coach Belichick and Quarterback Tom Brady, inspiring teachers and students to work together, support each other, and value hard work. The Patriots’ work ethic sets a terrific example for all of us. As with any winning season, daily preparation is critical for success; it’s not just the performance on game day. 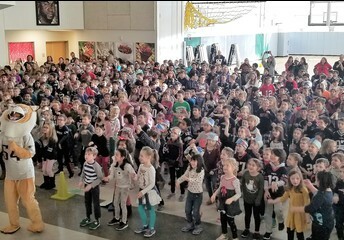 We nurture this teamwork and good sportsmanship at all grade levels, with lessons and activities that include social emotional learning and Responsive Classroom at our elementary schools, with WEB (Where Everyone Belongs) initiatives at all our middle schools, and with the H-block advisory, student-led clubs, community service and mentorships at the high school. We encourage our students and teachers to engage and support each other, and we believe this approach is key to students’ achievements within their school community. In the classrooms and hallways, in the cafeterias and offices, we strive to create a sense of community that supports our students and promotes their success. As we celebrate the Patriots’ winning season, shining a spotlight on the hard work, practice and unity of their team’s coaches and players provides inspiration and lessons for all of us on the APS team. $500 deposit for Full –Day Kindergarten. Check made payable to ‘Andover Public Schools’. 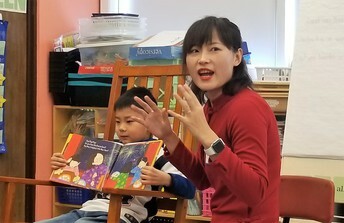 Half-day kindergarten is provided at no cost through the town. Financial assistance for full day kindergarten is available for those who qualify. All kindergarten students, regardless of FULL or HALF DAY, must be registered. More information can be found on our website. Shawsheen is also accepting appointments for screenings and tours on either Friday, March 22, 2019 or Friday, May 10, 2019 for September 2019 enrollment in the half or full day programs. For additional information about the program and tuition rates, please refer to www.aps1.net/shawsheen or call the school office at 978-247-8200. We ask parents to wait until a screening before filling out the registration forms. Congratulations to the AHS Mock Trial team! 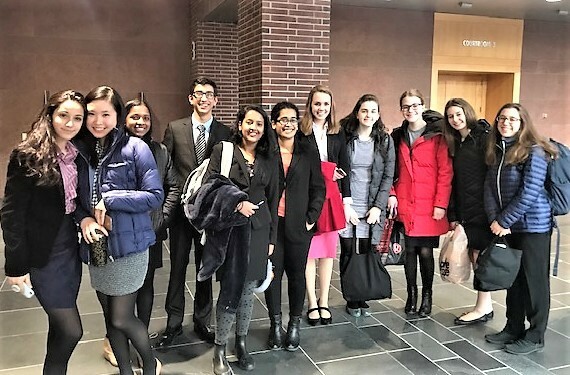 This past weekend, they were undefeated in the Mass Bar Association's preliminary tournament. Andover had wins against Lowell High School, Central Catholic, and Methuen High School. The team has qualified for the Regional Tournament to be held on March 3rd at Clark University in Worcester. 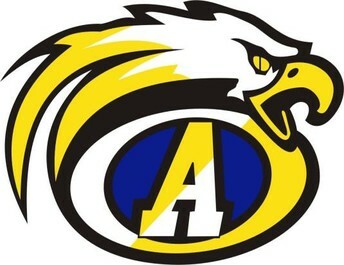 AHS will be one of 32 schools in Massachusetts competing for a spot in the state finals. If you’ve received printed materials from the schools or the town, chances are it passed through Diane Krafton’s hands. 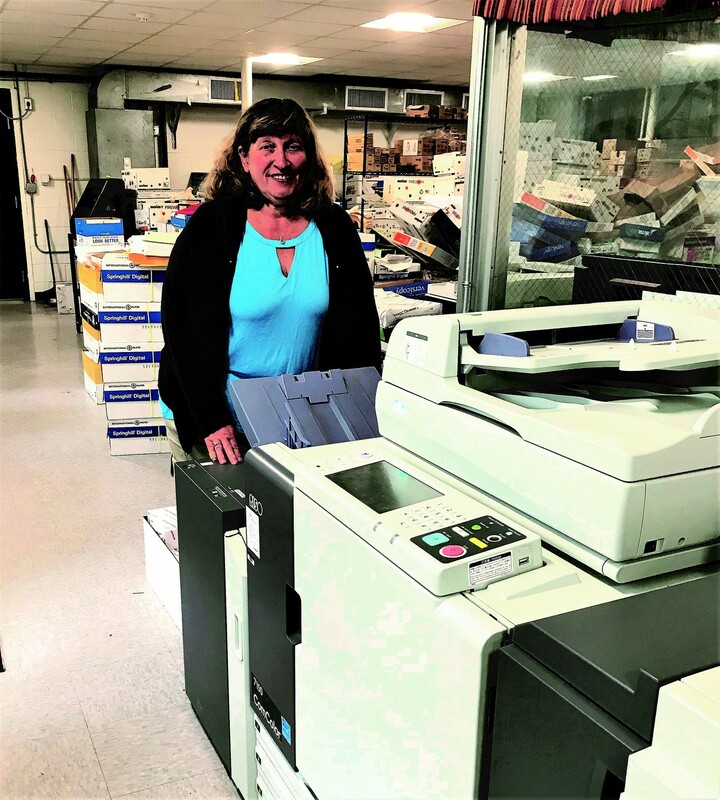 Possibly one of the best kept secrets in Andover, Diane has worked as the Copy Center coordinator for 31 years and will retire this summer. APS and the town has had the Copy Center for many years. Diane remembers the old days when the in-plant at Andover Public Schools printed only one thing: black-and-white booklets for its reading program. Back then, most of the bookbinding was done by hand. When Diane began her employment at the Copy Center, billing was still done with paper and a calculator. Diane’s diligence reduces costs and waste, and provides better quality for printing projects. Throughout the years, Diane has invested in new technologies to improve service and productivity. Now the district’s handbooks, workbooks, exams, envelopes, programs and business cards can be printed in-house in full color. She encourages teachers in need of large quantity print jobs to turn to her for fast turnaround and great quality. A model of efficiency, Diane takes pride in providing services to the community. Her goal is to make the copies she provides look better than the originals! Diane is able to print 385 copies per minute, or approximately 808,500 per week! Twice a year, Diane receives a delivery of white paper that fills an 18 wheel trailer. After three decades of service, Diane is looking forward to spending time with her grandchildren and renewing her commitment to her embroidery business in her retirement. This fall, you’ll likely find Diane at the Topsfield Fair, where she has worked part time for many years. Our best to you Diane on your well-deserved retirement! You may see an increase in police presence at Andover High School and West Middle School as they monitor traffic in our driveways and parking lots. The safety of our students and pedestrians is our number one priority. Please reduce your speed, pull over in the designated drop off and pick up areas, follow the flow of traffic, and do not operate your motor vehicle in any manner that could risk injury to our students.​ We appreciate your cooperation.